Jumping spiders are hunters. They don't lounge on a silk web waiting to ensnare a meat meal. Sometimes they just sneak up and grab their prey with their strong front legs. Other times they use their powerful hind legs to launch themselves towards their prey. Before their victim can say, "What the …? ", the spider dispatches it with an injection of paralytic venom delivered through its fang-like chelicera. Jumping spiders are well equipped to be predators. Along with powerful legs, they also have excellent eyesight with 4 pairs of eyes (The better to see you with, my dear). Indeed, their "flat faces" and two huge anterior eyes are prominent features of these spiders. Even though jumping spiders don't produce a silk web, they do use silk for other purposes. Before leaping, they tether themselves to a stationary object using a thread of silk called a "dragline" just in case they miss their target. 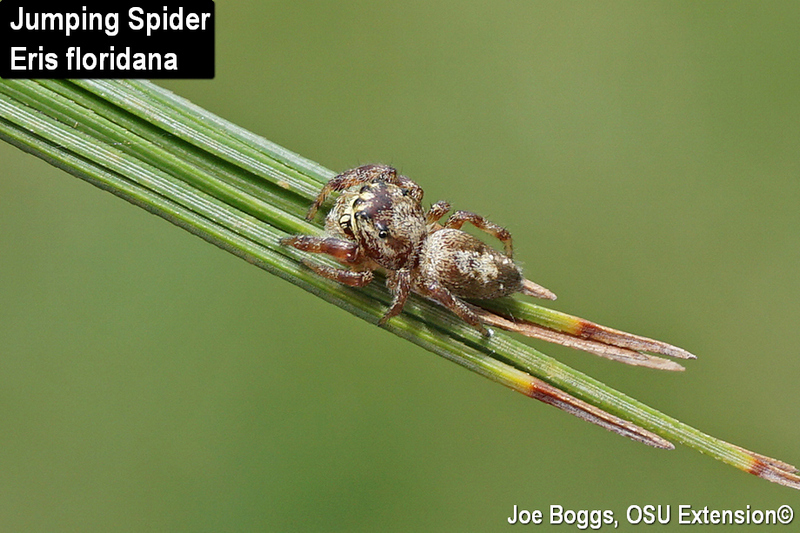 You may have observed this safety line if you've ever handled one of these small spiders (they aren't aggressive!). They'll rappel out of your hand on what seems like a never-ending strand of silk. Jumping spiders also use silk to form small structures, often binding together pieces of plants, where they spend nights and shelter from bad weather. They also use their silk sanctuaries as a safe place to deposit eggs. Females of many species will even remain inside their abodes to protect their eggs until they hatch. I recently came across several of these peculiar jumping spider shelters produced by the jumping spider, Eris floridana, on pines. This spider has no common name, but its frontal markings makes it look like its grinning ("Grinning Jumper?"). Their nests were almost dead ringers for needle structures produced by caterpillars of the pine tube moth (Argyrotaenia pinatubana). The caterpillars bind 10-20 needles together with silk to form a tube-like structure. They live inside the tube and feed on the ends of the needles. Of course, the needles on the jumping spider's silk abodes were not damaged. As with all of the over 600 species of spiders found in Ohio, jumping spiders are predators that eat insects as well as other arthropods. Many are plant pests. As I noted above, jumping spiders are not aggressive; neither are our other spiders. If you find one in your home, just gently shepherd it out of your house; they aren't biters. Of course you may first have a little fun by seeing just how long they'll keep spinning more silk to try and escape your attentions!